Rice side dishes are a staple that often find their way to my table and I always like it when you can incorporate some vegetables in them. This cauliflower rice pilaf inspired by Food & Drink magazine is a perfect example of a rice dish that includes a vegetable and the cauliflower and rice combination is an excellent one. When I first read this recipe I noted that it seemed to be very similar to a lot of curry dishes starting out with some garlic, ginger and green chilies. I then used a touch of garam masala to add some warmth and aromatics. I particularly like the use of the coconut milk in this dish as it always adds a really nice flavour to rice and it pairs well with the cauliflower. 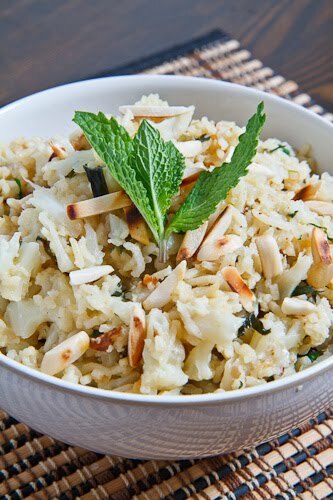 The mint finishes off the rice nicely adding an amazing freshness to the dish and the toasted almond garnish adds a change in texture. Add the cauliflower and cook until lightly browned, about 5 minutes. Add the garlic, ginger and green chilies and saute until fragrant, about 1 minute. Add the rice, coconut milk, water, garam masala, and salt and simmer covered until the rice is cooked and the liquid has been absorbed, about 20 minutes. Mix in the garam masala and mint and remove from the heat. Serve garnished with the toasted almond slivers. This looks so good. And it's nice to see you using Indian ingredients / styles in your cooking, garam masala for one. I could make a meal out of this! Delicious, Kevin… I can't wait to make it :). Lovely dish Kevin. Best wishes for the New Year. The theme for No Croutons Required this month is rice, and I would love to get a submission from you. Yum! This looks really tasty! I thought I hated curry until I made a butternut squash soup using it and I changed my mind! This rice dish looks wonderful. What a unique recipe. I really like the white on white in fact. I love the idea of cooking cauliflower right in with the rice, and curry is wonderful with cauliflower. I might try brown rice just to make it even more healthy. Your ingredient list calls for two separate additions of Garam Masala. The directions also call for two separate times it's added. (step 5 and 6). I'd just like to make sure before I run out for supplies. It looks amazing and I'm sure it will be a hit. shipleypowell: Yes that is correct. I often like to split the garam masala in half and add some at the beginning to cook in the sauce and some near the end to retain as much of the aroma as possible. Wow! Just came across your blog via Anne's Food and what a treat to discover. I love to cook and eat Thai and Indian food and see loads of luscious looking dishes to try, thank you. Thanks for the recipe Kevin, I'm going to modify it a little today (as some ingredients are near impossible to find on my city). I will swap garam masala with regular curry powder, green chillies with pickled chinese red chillies, mint for cilantro and almonds with pistachio, let's see how this ends out! I made this for dinner last night and it was delcious!! I added in some chickpeas and it turned out great!